Salt to taste – I probably added 1 tsp. Cook the onions slowly in the butter and olive oil with the salt to carmelize, about 10-15 minutes. Bloom the spices and then add the jalapeno. Cook for a few more minutes. Turn up heat, add sweet potatoes and then broth. Cook for about 30 to 45 minutes, allowing the potatoes to fully cook. Turn off heat and blend soup with a hand immersion blender. Turn heat back on. Add corn. Cook for about 5 minutes. Add coconut milk, lemon juice, syrup and cilantro. Cook for 3 minutes. Then you are done. Ready to serve. Heal oil and butter in large soup pot. Add onion & carrot and cook on medium for 5 minutes until they soften. Season with salt & pepper Add butternut squash and apple. Cook for another 3-5 minutes. Add broth and thyme. Bring to boil and simmer for 45 minutes. Allow to cool slightly and use an immersion blender to puree the soup. Add maple syrup, starting with 1/8 cup – taste. Add more if needed. Omit butter. Use vegetable broth or water for base. Use vegetable broth or water for base. Use a good quality, organic chicken broth. 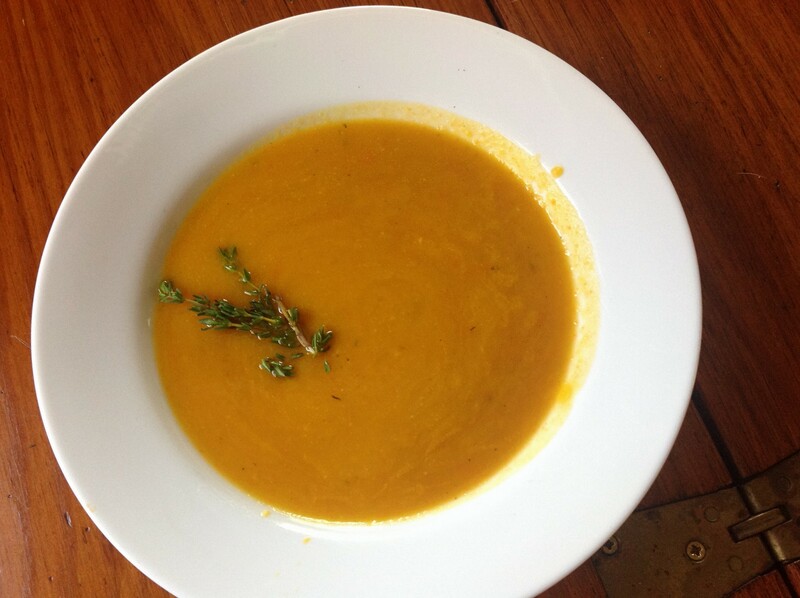 Serve with goat cheese as a topping or stir in 1/2 cup of goat cheese at the end for a super tasty, creamy soup! Welcome to Day 11 of our 21 Day Yoga Challenge! Looking for something healthy and warm to eat? 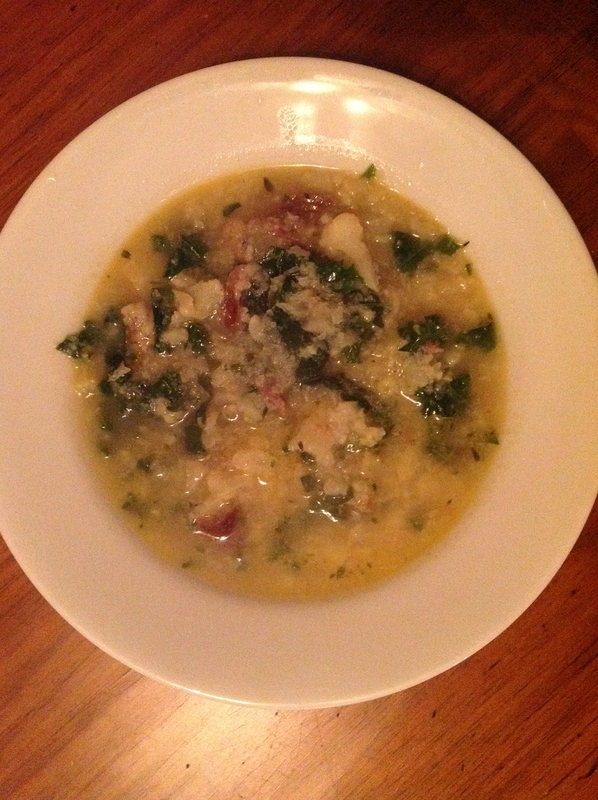 Here’s what I had for lunch today: my Cauliflower and Kale Soup. As always, if I post a recipe, it is my own creation. And be on the look-out for my cookbook coming out early Winter. I’ll have it for sale on my website and Amazon. I just love, love, love soup. Soups are easy to digest, packed with lots of vegetables and a meal in one pot. Add some crusty bread and bring a world of good to your body. Note: I’ve posted vegan and vegetarian options below. In a large soup pot, warm butter and olive oil. Saute the shallots and garlic until shallots soften – about 5 minutes. Add the red pepper flakes and thyme to taste. Then add your vegetable or chicken stock. Bring to a boil. Add cauliflower. Reduce heat and cook for about 20 minutes. Use an immersion blender or potato masher to blend soup. Add kale, sausage and Parmesan cheese. Cook for an additional 5 to 10 minutes. 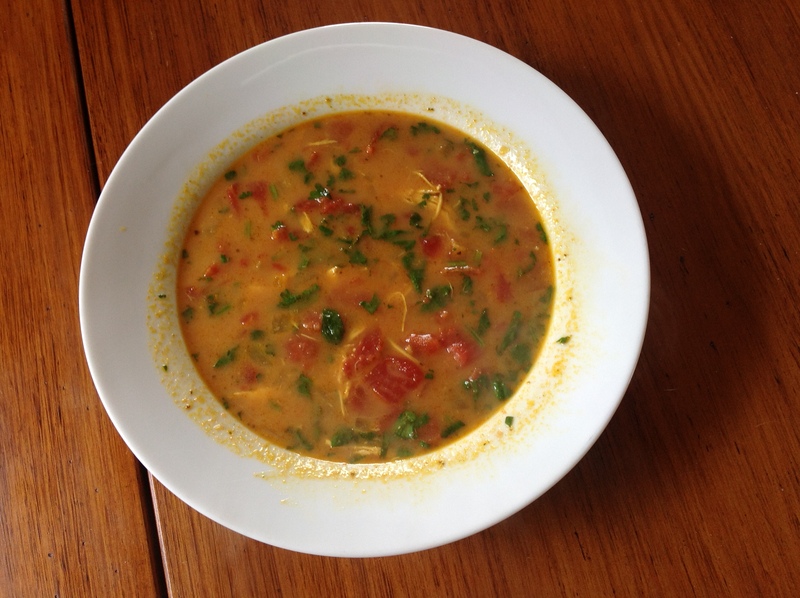 My Recipe of the Week: Gazpacho Soup! It’s Day 3 of our 21 Day Yoga Challenge. How are you doing with your daily meditation and yoga practice? If you’ve missed a day or haven’t started yet, don’t worry. We simply move forward to create more healthy habits. Chop vegetables into very small pieces of equal size. Add all ingredients together. Use an immersion blender to create a finer blend. Cook carrots, onion and shittake mushrooms in olive oil until soft. Season with salt. Add fresh grated ginger. Add stock, garlic and canned mushrooms. Cook for 20-30 minutes. Add parsley and lemon juice. Cook for 5 more minutes. Like Thai food? Have I got a great recipe for you! You are going to love my Quick & Easy Thai Chicken Soup. Also, our 28 Day Yoga Challenge starts April 1. Join us in setting the intention to do at least 5 minutes of yoga a day and 5 minutes of meditating. If you enter your email on my blog home page, http://suzannemorganyoga.com, you’ll get 28 days of videos, recipes and tips for healthy living. Spread the word and tell your friends! In soup pot, saute onions and seasoning in olive oil until the onions are soft. Add garlic and continue cooking for 1 to 2 minutes. Add 1 cup of chicken stock and deglaze the pot, bring to a boil. Add remaining chicken stock, tomatoes and cooked chicken. Bring to boil, then cook for 20 minutes on low heat. To finish, add cilantro and coconut milk. Cook for 2 to 5 more minutes. Enjoy! 1) Frozen minced garlic can be found at many groceries stores packaged in small little cubes, as shown in photo. This can save time. Allow 2 cubes to come to room temperature before adding to the spices. 2) Using a store-bought, good quality roasted chicken goes a long way in saving time. 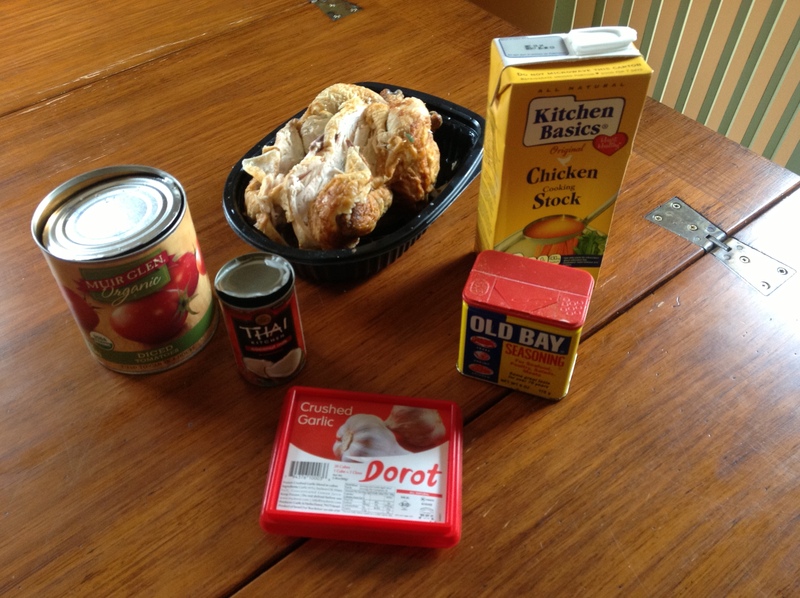 Try to find a roasted chicken with no spices or remove the skin and spices before adding the chicken to the soup. 3) Some stores sell small cans of coconut milk (about 5 oz.). This is a nice option if you think that the milk will go to waste if you buy larger can. 4) Good quality, organic, canned tomatoes are actually preferable to using fresh tomatoes and again, it saves time. 5) This recipe is fairly spicy. If you don’t like a lot of spice, cut back slightly on the cayenne pepper, curry and Old Bay. If you like your food super spicy, add a bit more. 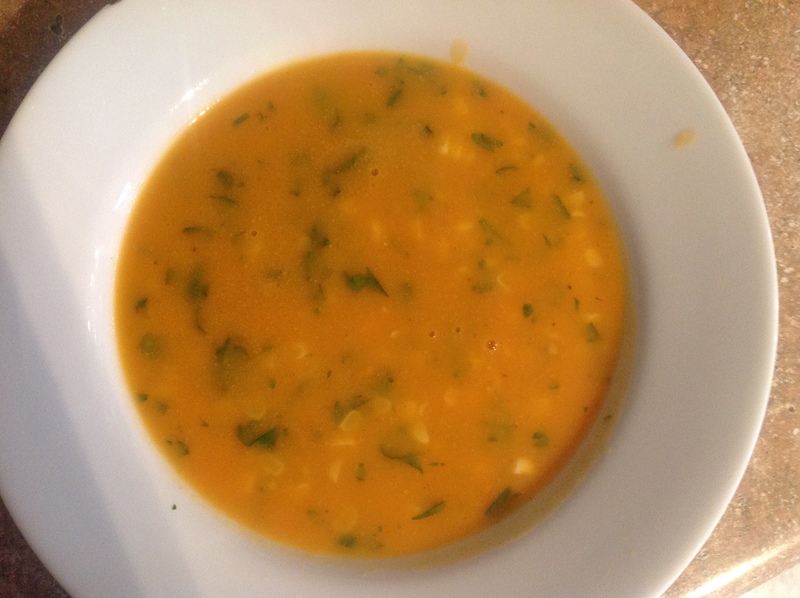 I made this satisfying soup last night and couldn’t wait to share my recipe with you. 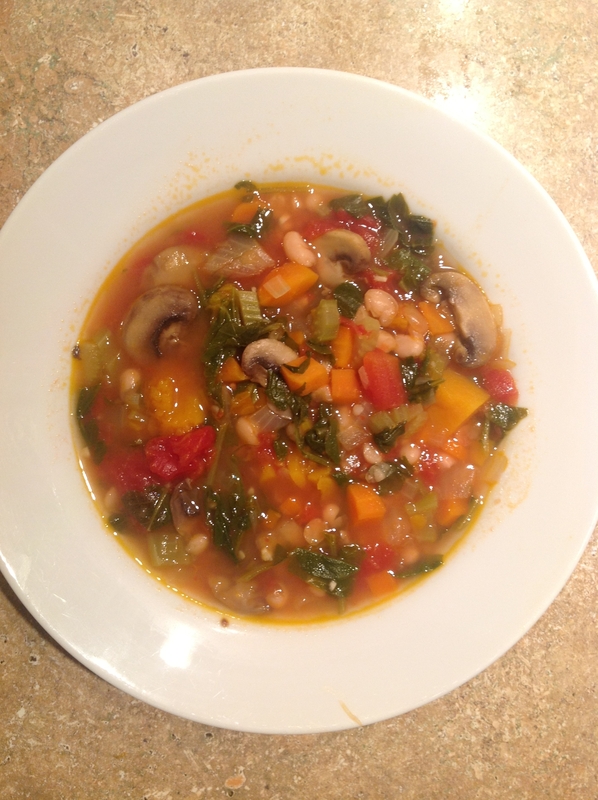 It’s delicious, super healthy and will warm you up on a cold night. 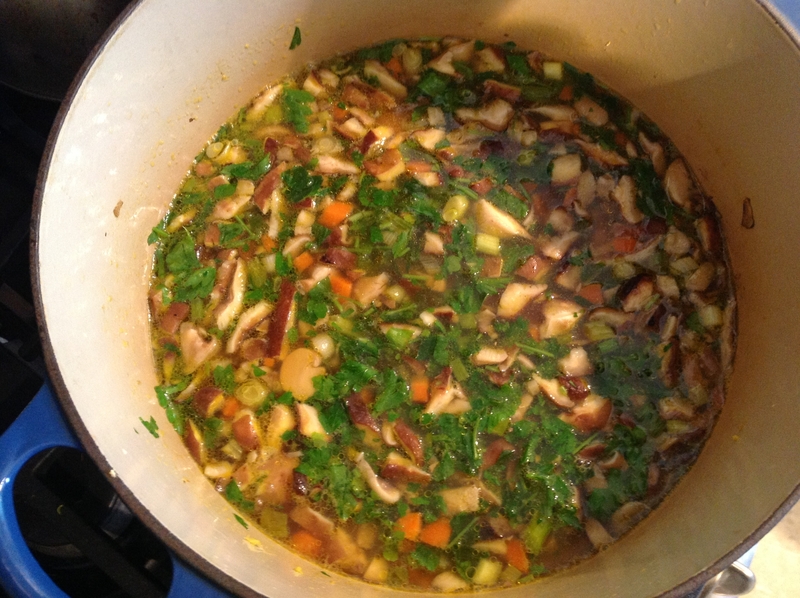 In stockpot, cook mushrooms in 2 Tablespoons of olive oil until browned, about 5 minutes. Set mushrooms aside. Cook carrots, celery, onion, salt in remaining 2 Tablespoons of olive oil until softened, about 10-15 minutes. Add garlic and cook for a few more minutes. Add tomatoes, bay leaves, and bring to boil. Add the water, soy sauce and Parmesan rind. Bring to boil, decrease heat and cook for 15 minutes. Add butternut squash and cook for additional 20 minutes until squash is cooked through. Add spinach, mushrooms, beans and cook for an additional 10 minutes until heated through. Serve with a squirt of lemon to brighten. Add Parmesan on top if you prefer.